Dortmund have not won in Munich in 20 years. Their last win in Munich came in 1991 and Klopp has yet to win a single point at the Allianz Arena since taking over in Dortmund. After putting themselves in prime position to lift the title, Dortmund came into this match under a bit of pressure. Their play hasn’t been as consistent this year as it has in the first half of the season and they have been criticized for their inability to put games away. They dropped 6 points in the first 5 matches of the New Year, almost as much as all 17 matches of the Hinrunde combined. Nevertheless, Klopp continued to keep the faith in his team and fielded Dortmund’s youngest ever side in league history against Bayern. He kept the same team that beat St. Pauli last week with Subotic returning and Langerak filling in for the injured Weidenfeller. Bayern meanwhile came off arguably their biggest win of the season, a 1-0 victory against Inter in Milan. They have scored 18 goals after the break and have looked at times unstoppable since being able to field both Robben and Ribery. Van Gaal continued with the line up that won in Italy, switching only Gustavo and Pranjic around. The idea, presumably, was to put the quick Gustavo on the side of Dortmund’s creative playmaker Goetze. Dortmund beat Bayern 2-0 in the first fixture this season and Bayern had to keep up the pace for a Champions League spot, especially with Hannover and Mainz winning earlier in the day. Lineups using average positioning, shows disconnect between Bayern midfield and attack. The first half was as good a 45 minutes of football that you’ll see anywhere in Europe this season. It was a continuous back and forth display of attacking football and a fantastic advert for the Bundesliga. Bender and Lewandowski had chances early on and it did not take long for Dortmund to get off the mark. Badstuber collected the ball in defense and passed it off to Schweinsteiger, who had his back to two Dortmund players, had a poor touch and gave the ball right to Grosskreutz who proceeded to feed Barrios for a cool finish from 5 meters out. Bayern equalized just 5 minutes later through Gustavo from a corner but Dortmund’s pressure was relentless from the getgo. Few teams in Europe run and press with more intensity than Dortmund and this was very much on show in this game. Dortmund never took their foot off the pedal and effectively stifled Bayern’s gameplan. Bayern have always struggled when they don’t dictate the tempo of the match or are not in full control and against sides like Dortmund and Mainz that hassle incessantly they tend to get shaken up. The first goal was very much an example of Dortmund being ready to pounce on the slightest error and be in a good position to exploit that error. Dortmund took the game to Bayern like no other this season and got forward at every occasion. On 18 minutes, Barrios received the ball and burst down the field only to be caught by Robben. The ball was laid off to Götze who saw an oncoming Sahin behind him. The stand in captain curled a wicked ball into the top left corner from 18 meters out. One of Dortmund’s strengths is their numbers going forward. They attack with 7 players at times so there are always options to pass it off to or players making runs. Against a makeshift and frail defense as Bayerns’ this was a very effective gameplan. The intense pace continued for the rest of the half. An offsides call on Gomez and a Piszczek block on Müller denied Bayern from equalizing. Overall Dortmund imposed themselves and forced Bayern out of their comfort zone. Schweinsteiger and Pranjic were having subdued performances but it was no doubt helped by Dortmund’s high energy pressing and their impressive marking of key players like Robben and Ribery. Hummels rises above Schweinsteiger to put the game to bed. Van Gaal rightfully replaced the out of form Badstuber with Breno and the match decreased in tempo but Dortmund remained very much in control and frustrated Bayern. Dortmund seemed comfortable with allowing Bayern to advance towards their goal knowing they were able to match them defensively. Bayern had nearly 90% of possession after halftime but were continuously denied by a well-drilled and organized Dortmund side waiting for the ideal time to break on the counter. Van Gaal brought on Kroos for Gustavo in an attempt to have a better presence in the middle of the pitch as they were getting pushed back and outplayed. Eventually Bayern’s frustration played right into Dortmund’s hands and Klopp’s side took advantage. Grosskreutz and Götze won a corner from another counter attack from which former Bayern player Hummels scored to put the game to bed. Bayern continued to go to Ribery and Robben but to no avail. Dortmund thwarted everything Bayern threw at them and Klopp secured the win by putting on defensive midfielder Da Silva to close out the match. All in all, Bayern lacked a plan against a highly motivated and energetic Dortmund team. Few teams are able to match Bayern’s impressive offense so they tend to rely heavily on those outlets. When they don’t work and key players are marked they have a difficult time adapting to the circumstances. Dortmund ruled the middle of the pitch. After the match, a search mission was put together to try and locate Robben and Ribery. That is how anonymous the pair was throughout the match relative to the impact they usually have in games. Klopp instructed Schmelzer and Grosskreutz to double up on Robben and the Dutch winger rarely found the space he needed to cut inside like he usually does. Robben lost the ball more than anyone else on the team (26) was kept out wide for most of the match. On the other side, Ribery lost the ball 20 times and saw the ball less than he has in the previous couple of matches where he was always one of the more involved players on the pitch. Bayern had nearly 70% possession by the end of the match but found it very difficult to get going or penetrate Dortmund’s defense. For all their possession, Bayern were also dispossessed way more than they are normally accustomed to. Dormtund’s possession figures are skewed because of their direct style of play. With every possession, the Dortmund players looked for the most direct path to goal and aimed to unhinge Bayern’s defense but the key to their impressive win was their dominance in central midfield. They achieved this primarily by pressing high up the pitch and pinning Schweinsteiger and Pranjic back and not allowing them to distribute the ball and link the attack. A look at the average positioning of both tea ms reveals just how deep Schweinsteiger and Pranijc were throughout the match. Both normally join the attack but Bender and Sahin ensured that they would not get out of their own half. Schweinsteiger lost the ball 24 times and had a season high 22 passes miss their target. The discrepancy in central midfield is even more glaring when looking at the concentration of plays both teams had on the field. 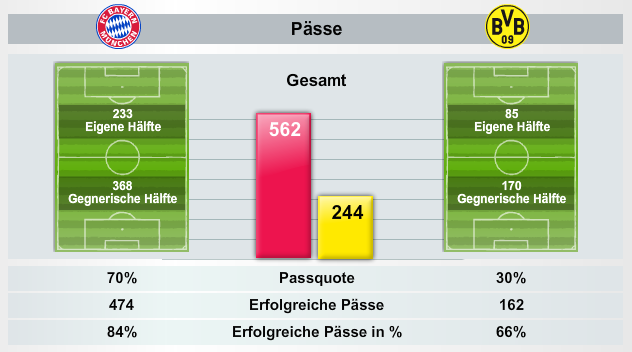 Bayern had a combined 220 plays on the right and left side and only 89 in the middle, a meek 27%. In comparison, 40.3% of Dormtund’s plays were down the middle of the pitch. Bender and Sahin were the clear winners in the middle and thus were able to dictate much of the game. This was without a doubt one of the better matches of the season and a symbolic win for several reasons. It pitted the table toppers against the defending champions. Dortmund’s title aspirations have been questioned all year long and even more so recently with Kagawa’s absence and Dortmund’s stuttering performances. Klopp’s men came into this match with something to prove while Bayern’s bosses were eager in pointing out how much better their side was prior to the match. what was very surprising in this game: in the last minutes of the game Bayern didn’t try to play any high balls into the box. LvG brought Klose in, who is excellent in the air, and Gomez was already on. why didn’t they try that as a hail mary in the last 15 minutes? I thought that this was what LvG was going for. Bayern seemed to be completely out of sorts in this match. I put a lot of faith in stats but they are misleading and this game is a perfect example of how they can be. This reminded me very much of the Inter-Barca semi final last year. Mourinho was content to sit back and invite the attacks, rely on his organized defense as well as his team’s ability to counter. It is playing smart, playing within your means and playing to your strengths. Not saying Dortmund is a counter based side, just that they did exactly what they had to in this game defensively and offensively. As for the numerical advantage, that is what good organization can bring to a team. It is about knowing where to be, what runs to make, etc. as well as being able to rely on your team mates and being in sync. Klopp has this side drilled very well. Expert analysis. Very insightful. Possession percentages are so misleading if a team is strangled in their opponent’s third of the field, as Bayern Munich were today. Because of their movement and formation, Klopp’s men seem to have the numerical advantage at any spot on the field. Amazing job of coaching.